Description: The circulation of knowledge, objects, and people has attracted scholarly attention in recent years from a variety of disciplines. This reading group investigates this scholarship to examine how knowledge was shaped by long-distance voyages and encounters in the global seventeenth and eighteenth centuries. We welcome participants from any discipline interested in this early modern phenomenon, and are particularly interested in the possibilities of transcultural analyses that explore how knowledge and culture were transformed by the entanglements of voyagers and locals, in Europe and beyond. This reading group is being held in association with this year’s Core Program at the Clark Library in conjunction with the Center for 17th- and 18th-Century Studies. Our first meeting is scheduled to take place on Thursday, November 13th at 4pm in the History of Science Seminar Room, 5288 Bunche Hall, UCLA Campus. On that day we will be reading Greg Dening, The Death of William Gooch: A History’s Anthropology. This work is available in library and online for purchase. If you have any questions, or if you would like to be added to this reading group’s mailing list, don’t hesitate to contact Eric Otremba at ericotremba@ucla.edu<mailto:ericotremba@ucla.edu> for more information. 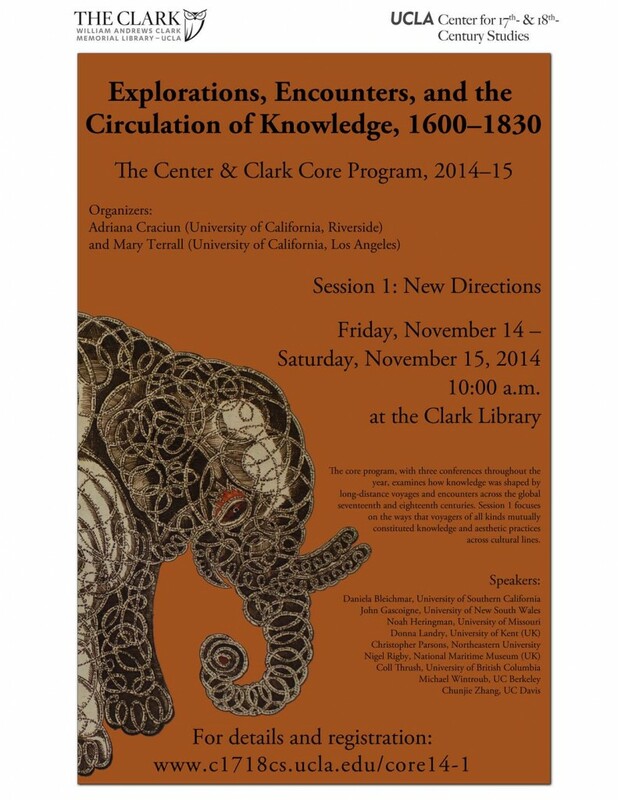 Eric Otremba, Elizabeth Montanez-Sanabria, and Matthew Goldmark, group organizers of the Reading Group on Explorations, Encounters, and the Circulation of Knowledge. A common response to an electronic book or other digital media is that, while it may be better or worse than a book, “this is not a book.” But digital media has the uncanny effect of making us realize that physical books themselves were never truly books–if by “book” we mean a long form of attention designed for the permanent, standard, and authoritative communication of human thought or experience. This talk outlines methods for discovering and tracking socially repeatable and valued “long forms of attention” whether in books or other constellations of materials, in the past or the digital present. The talk concludes with a look at the RoSE (Research-oriented Social Environment) created by a team at the University of California, Santa Barbara, directed by Liu. Alan Liu is Professor of English at UC Santa Barbara and a leading scholar in digital humanities. He is the author of The Laws of Cool: Knowledge Work and the Culture of Information (Chicago, 2004), Local Transcendence: Essays on Postmodern Historicism and the Database (Chicago, 2008), and Wordsworth: The Sense of History (Stanford, 1989). He has developed several significant digital humanities projects: the University of California multi-campus research group Transliteracies Project (2005-10), the NEH-funded RoSE (Research-oriented Social Environment), and the ground-breaking Voice of the Shuttle Humanities gateway. Free and open to the public. Co-sponsored by the Critical Digital Humanities group. The Material Cultures of the Book Working Group is a graduate student-run Andrew W. Mellon Workshop in the Humanities in the Center for Ideas and Society at UC Riverside (bookhistory.ucr.edu). Directed by Adriana Craciun (UC Riverside) and Mary Terrall (UCLA). The circulation of knowledge, objects, and people has attracted scholarly attention in recent years from a variety of disciplines. The core program for 2014-15 will draw on several strands of this scholarship to examine how knowledge and culture were shaped by long-distance voyages and encounters in the global seventeenth and eighteenth centuries. We are particularly interested in the possibilities of transcultural analyses that explore how knowledge and culture were transformed by the entanglements of voyagers and locals, in Europe and beyond. 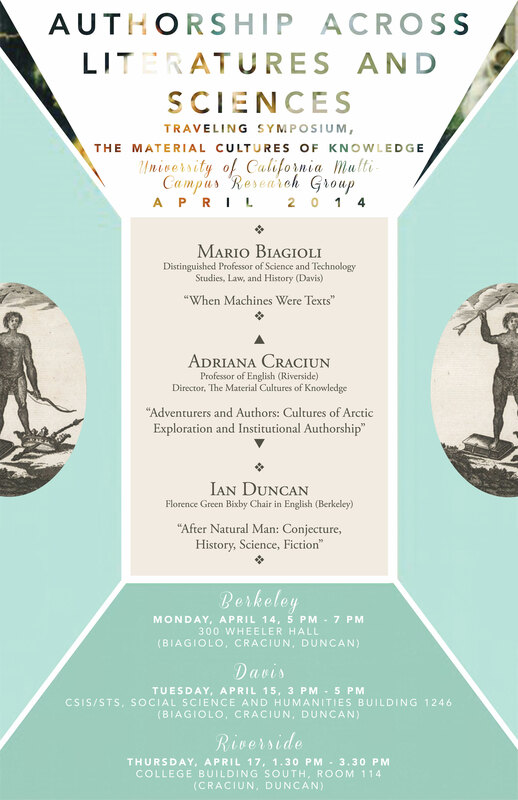 The program will bring together scholars of the history of science, art history, literature, anthropology, geography, maritime history, and material texts to discuss new approaches to these questions. This conference considers the new directions emerging in studies of exploration and encounters from roughly 1600-1830[MT1] . Exploration history has been transformed in the last decades of the twentieth century by a welcome turn to postcolonial and feminist critiques of the grand narratives of discovery and progress that had characterized the field in the past. Increasingly in the twenty-first century, indigenous perspectives of such encounters are no longer presented as a counterhistory to that of mobile Europeans who initiated a “fatal impact” into a static, local culture. Instead, practices of indigenous people are often central to symmetrical approaches that consider ambiguities, uncertain outcomes, and contingencies in these encounters. This conference will bring together scholars conducting innovative work on how diverse voyages and voyagers, indigenous and European, mutually constituted (not without conflict) knowledge and aesthetic practices across cultural lines.